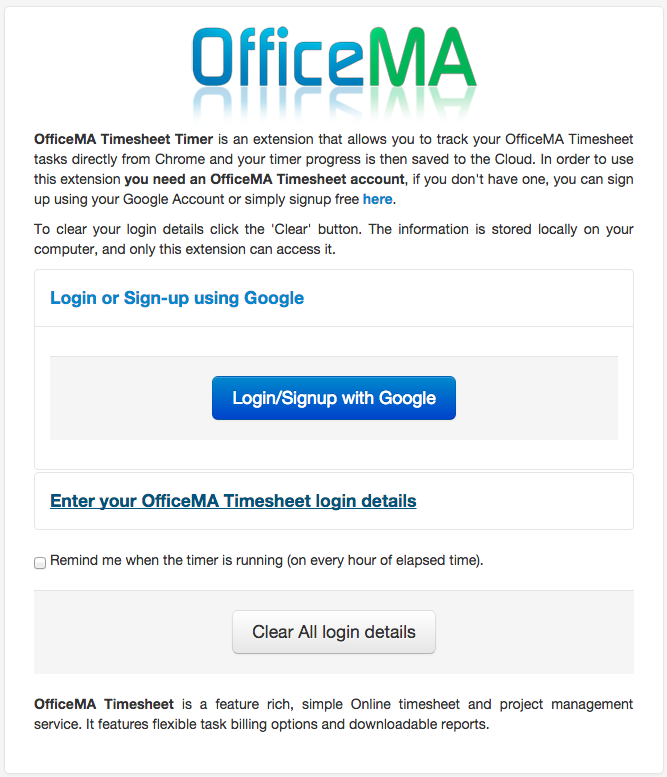 Sign in using Google: Now you can Sign in to OfficeMA Timesheet using personal Gmail and Google Apps for Work accounts. More details here. Generate Invoice: Users with professional accounts can now export billable timesheet entries as an invoice. Click here for more details. 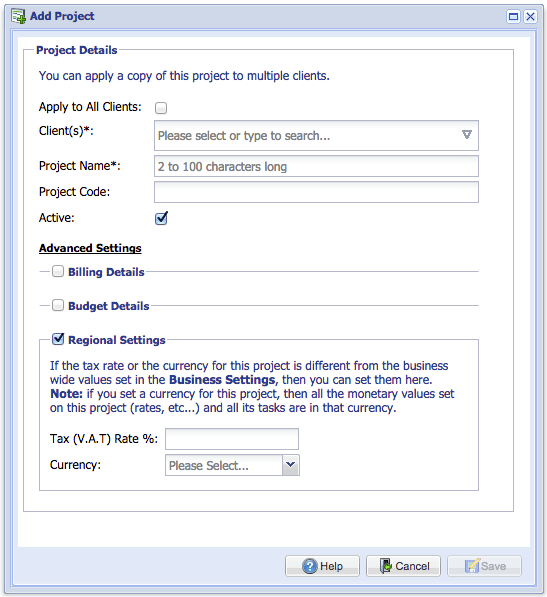 Per Project Currency and Tax Rate: This is a handy feature for users who operate projects across multiple regions that require their own currency and tax rates. See here for more details and an example. FireFox Timer AddOn: The OfficeMA Timesheet Chrome Timer extension is now available as a Firefox AddOn. You can also sign in with Google when using the Chrome Timer extension. 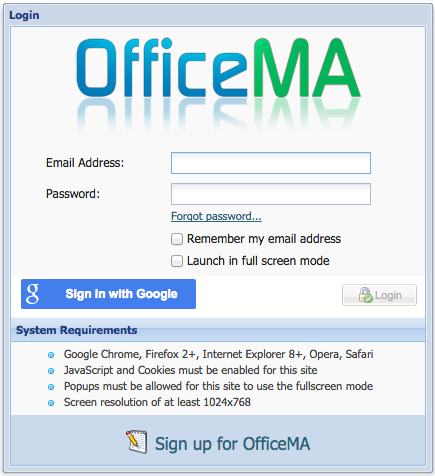 On the options page, instead of entering your OfficeMA Timesheet login details, such as email address and password, simply click the Sign in with Google button to authenticate using your Google account. 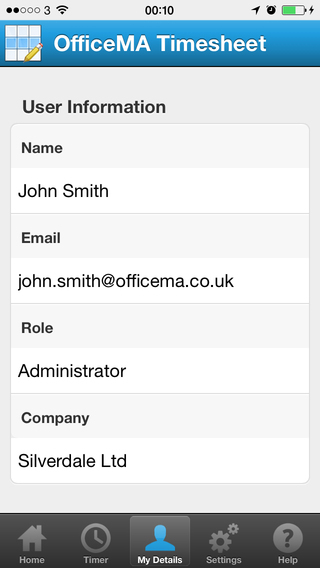 New users can also sign up for OfficeMA Timesheet by using personal and Google Apps for Work accounts. 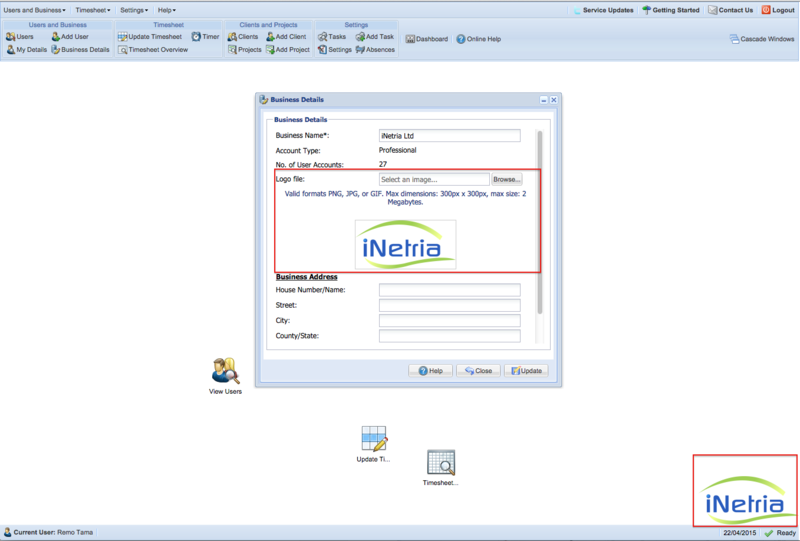 When using OfficeMA Timesheet you can set a business-wide currency and tax rate in the Business Settings window. OfficeMA Timesheet will use the the tax rate to calculate Gross amounts in the revenue reports. The currency is used to format monetary values. The tax rate set for the project will take precedence over the business wide tax rate. This is handy if the project is billed in a region with a tax rate different from the business wide rate. 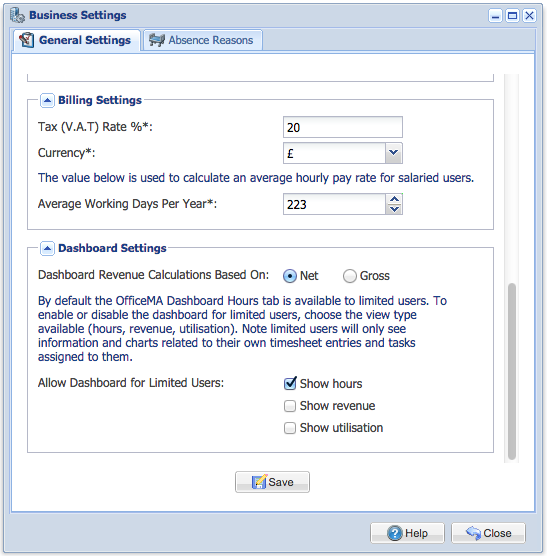 Dashboard Window: All revenue values in the dashboard reports are displayed in the business wide currency defined in the Business Settings window. If any of the projects use a custom currency then currency conversion* is done so that all values are in the business’s main currency. If all the displayed values use the same currency then they are displayed in the that currency. If the displayed values contain a mix of currencies then all the values are converted* to the business’s main currency. Project 1: Uses CNY (Chinese Yuan Renminbi) as currency and 0% tax rate. Project 2: Uses EUR (Euro) as currency and 15% as tax rate. 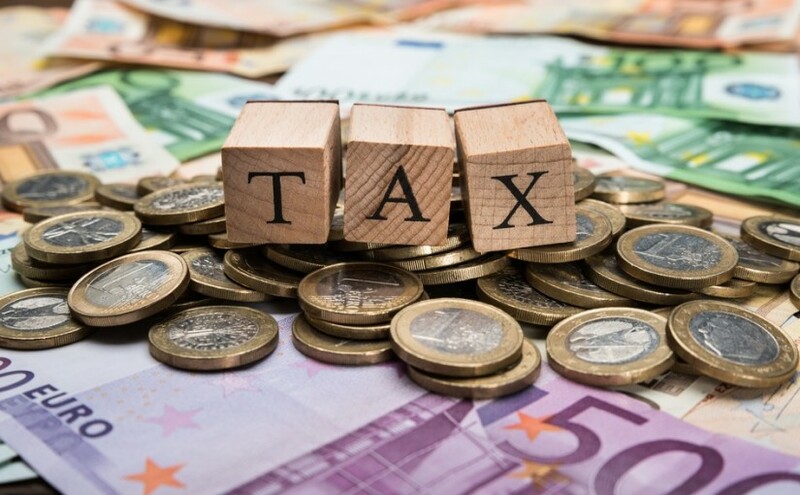 In all scenarios the tax rate defined at the project level takes precedence over the one defined in the Business Settings. * OfficeMA Timesheet uses open exchange rates for currency rates. When currency conversion is used the values displayed/exported are provided for informational purposes only, and do not constitute financial advice of any kind. Although every attempt is made to ensure quality, NO guarantees are given whatsoever of accuracy, validity, availability, or fitness for any purpose – please use at your own risk. 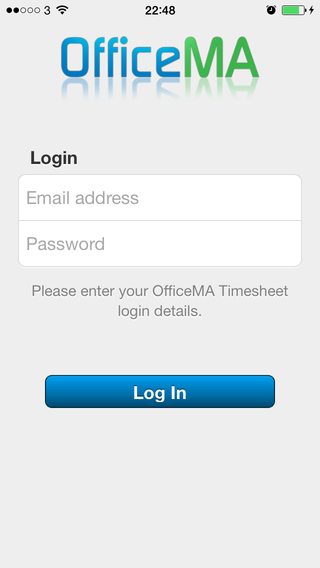 We have recently added many features and made many enhancements to OfficeMA Timesheet. This blog post summarises all these new features and improvements. Name length: The 4 to 50 character name restriction on clients, projects and taks has now been relaxed to 2 to 100 characters. Name Uniqueness: Projects and tasks names had to be unique, which meant you could not create a task with the same name across projects, or a project with the same name across clients. Now project names only have to be unique on the same client rather than globally. The same applies to task names, they only have to be unique on the same project. Ability to Delete: You can now delete clients, projects and tasks. Note: deleting a client will delete all its projects, tasks and timesheet entries, the same cascade principle applies to projects and tasks. Search Minimum Length: The minimum required length for searching has been reduces from 4 to 2 characters. Update the timesheet for the users they manage, even if the manager is a limited user. This is handy if someone is ill and their timesheet needs completion, then their manager can complete their timesheet on their behalf. 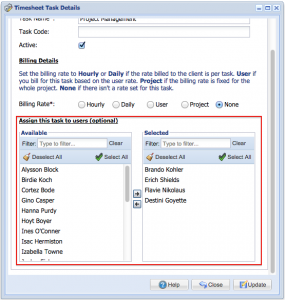 This feature is particularly useful when you don’t want to make all managers administrators. 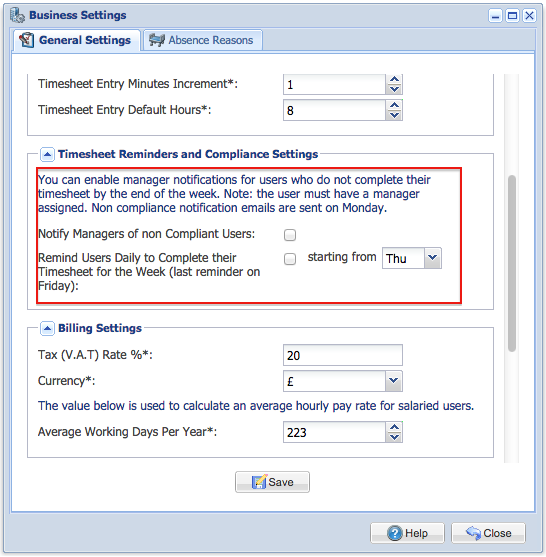 Manager can receive a compliance reports indicating which members of their staff haven’t completed their timesheet for the previous week (see next section). Now you can enable email reminders for timesheet completion. This can be done from the ‘Settings’ window. When enabled OfficeMA Timesheet will notify your users everyday from the day you’ve selected to Friday to complete their timesheet if they haven’t done so already. Compliance emails are sent to managers on Monday for the previous week. 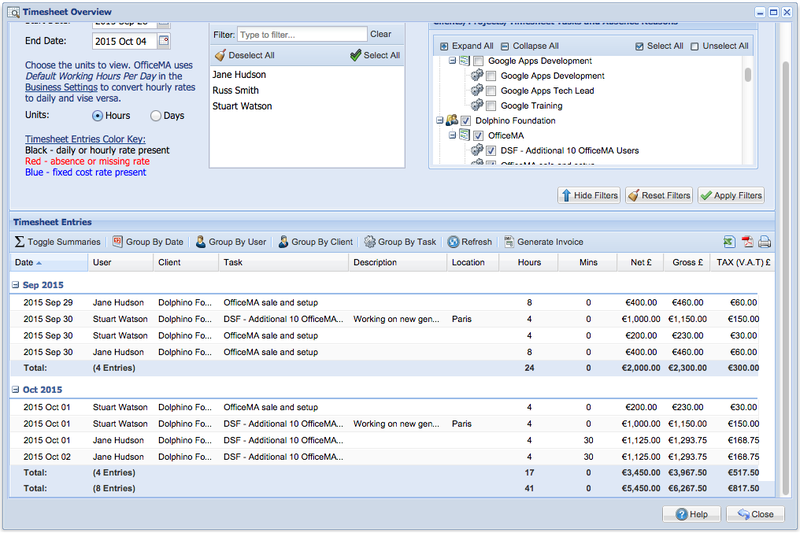 OfficeMA Timesheet multiplies the working hours for each user by 5 to determine if they are compliant or not. For part time users that work a few days a week, you need to average their hours over 5 days and enter it on their pay rate details. Otherwise they will be flagged as non compliant to their manager. Previously if your data exceeded 100 rows you had to page through it to be able to export everything. Now you can click the small arrow on the export icons to reveal an ‘Export All’ option (see the screenshot below). 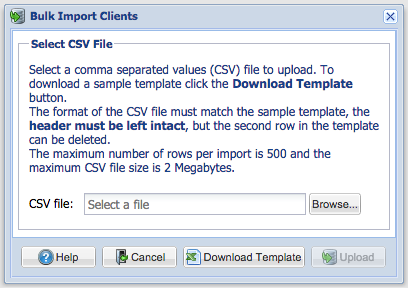 Bulk import is available by clicking the import icon on the toolbar. Using bulk import you can easily import hundreds of users, clients, projects and tasks in seconds. Click here for more information about this feature and the available templates (Note: this feature is available for the Professional accounts only). 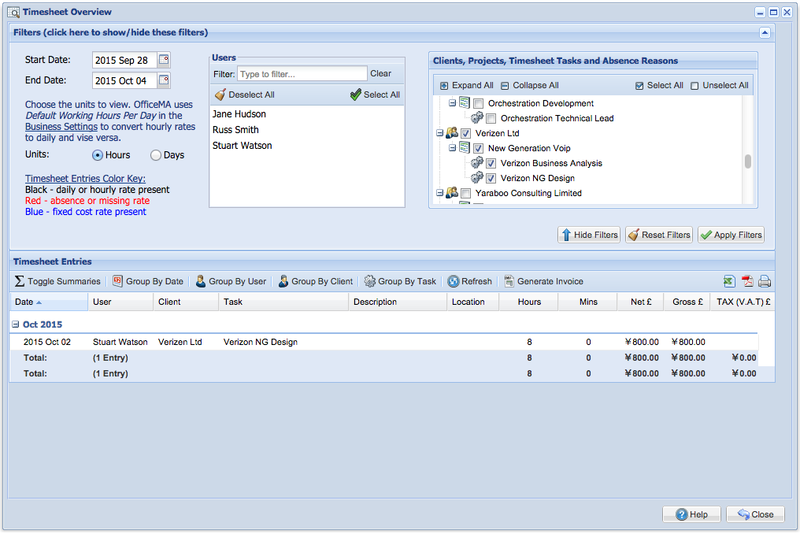 The timesheet overview window now has the project available in the table and exported reports. To show the project column simply enable it from the column headers (see the screenshot below). The time is now split into hours and minutes, this has previously shown decimal hours which were hard to interpret. A number of utility buttons have been introduced to aid with the grouping, this feature was always accessible from the column menu. 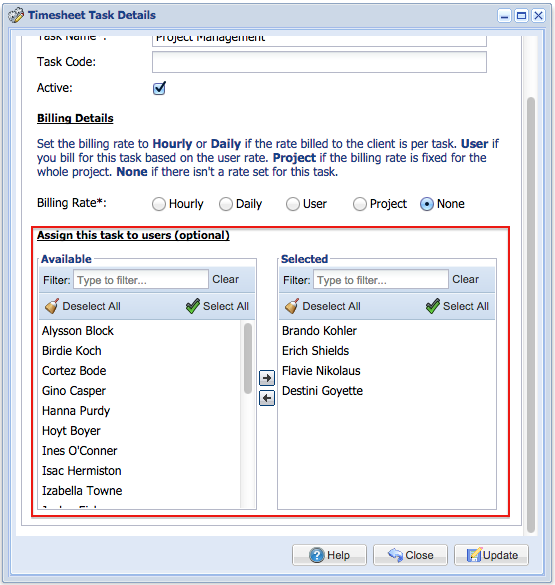 Tasks using fixed cost project rates are now shown in blue. You can apply projects to all clients, for example if you are creating a ‘Branding’ project across all clients. 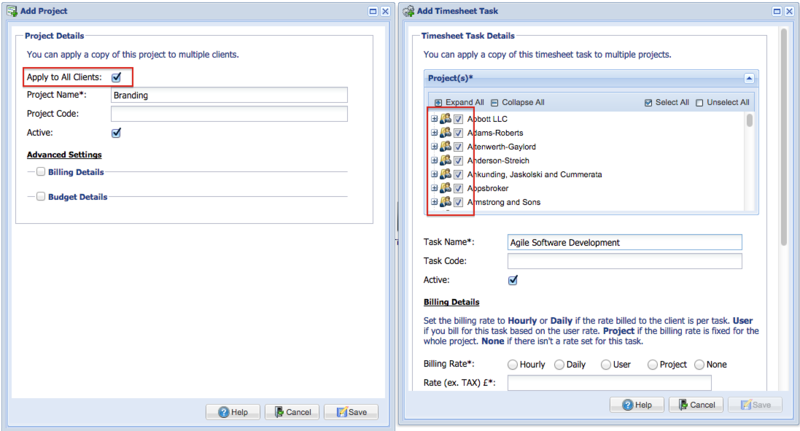 You can also apply tasks to all projects, for example if you are creating a ‘Software Development’ task on all projects. Previously you had to do each one individually. Assigning many tasks to a single user. Use the ‘User Details’ window. On this window you can still use the previous flat view if you prefer by clicking the ‘Nested View’ title (Improved). Assigning one task to many users. Use the ‘Task Details’ window (Improved). Assigning many tasks to many users. Use the ‘View Tasks’ window (New). We have a brand new dashboard that crunches all the timesheet entries and provides you with an insight into your business’s performance. 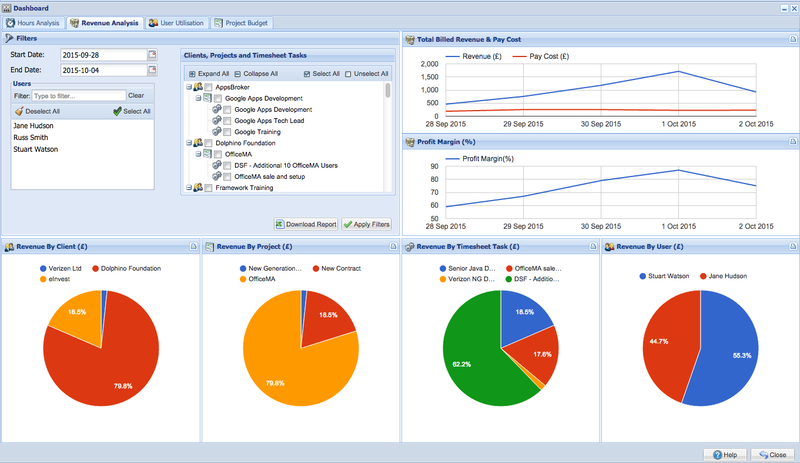 The dashboard features many charts, with the ability to download the raw data as CSV (available for the Professional accounts only). 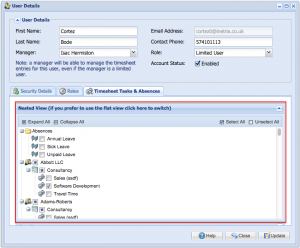 To make the most of this dashboard and its reports you need to ensure that all non working tasks are entered as absences in the ‘Absences’ window. Also all billable tasks need a charge rate set. In terms of cost, you need to ensure that all your users have a pay rates set. 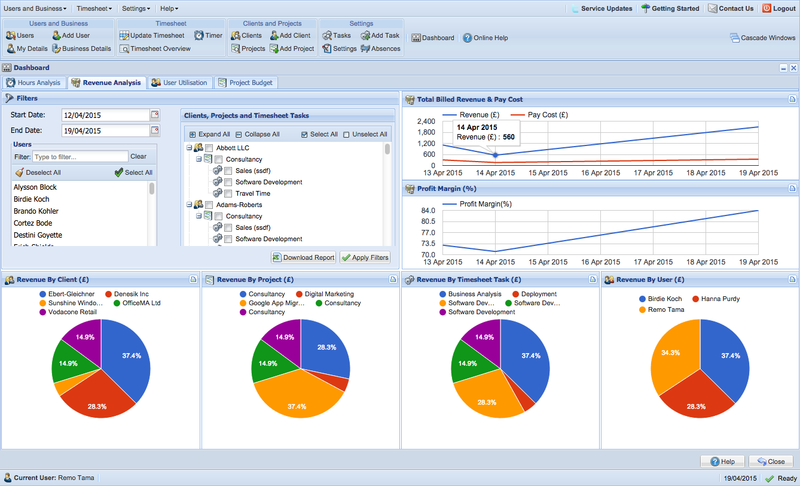 For project budget and expenditure you need to ensure that the budget details on each project are populated. 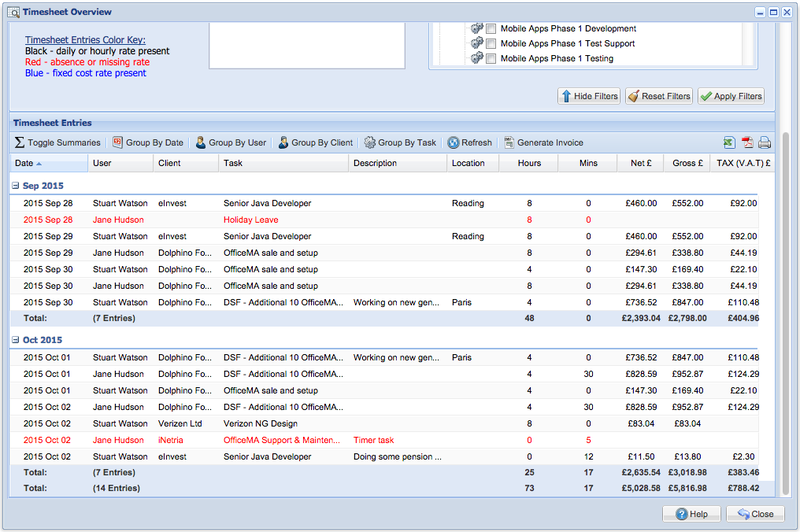 Hours Analysis – Gives an overview of all hours work and a break down by client, project, task and user. 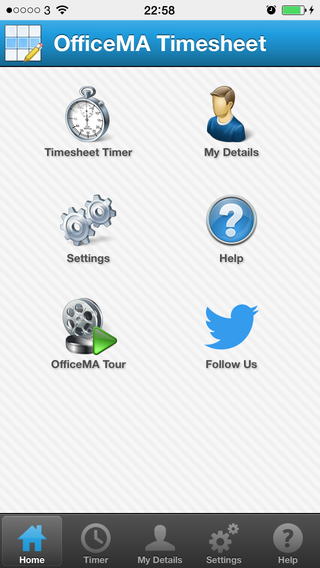 The OfficeMA Timesheet mobile app has arrived. 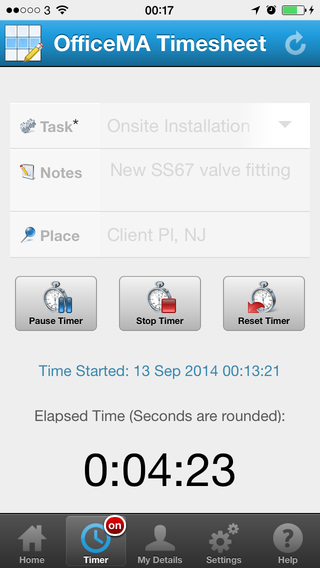 The mobile app includes the timer feature which enables you start, pause and stop the timer on the move. To install the application follow the relevant link for your phone or simply scan the QR code with your phone. Once you download and install the app, tab the app icon, after the splash screen you will be prompted to enter your OfficeMA Timesheet login details (first time only). Enter your login details and tab the ‘Log In’ button. Once you are logged in the home screen will show. From here you can navigate to any of the app tabs. 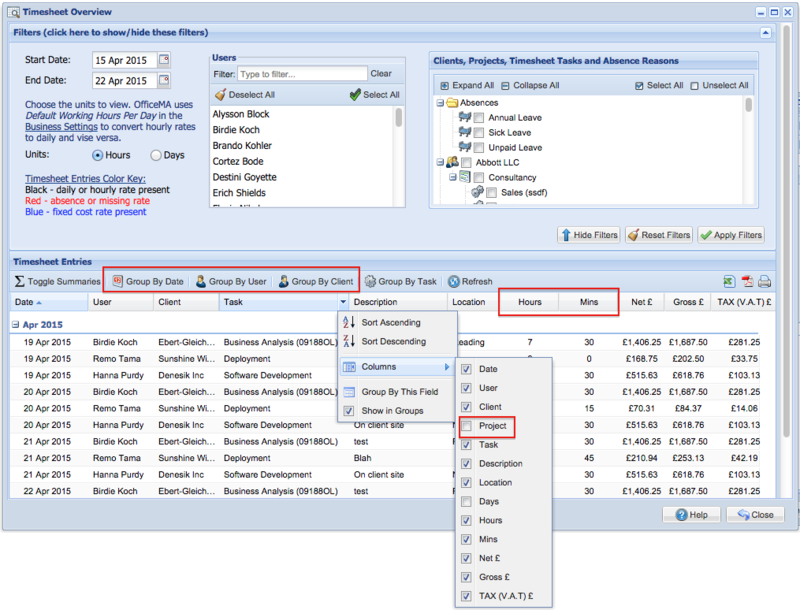 The Timer tab enables you to start, pause and stop the OfficeMA Timesheet timer. 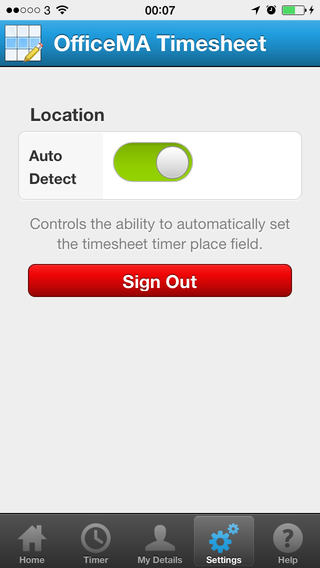 To refresh the timesheet tasks and to automatically populate the current place (location) simply tap the refresh button. The location will only be detected if the location feature is enabled in the Settings tab. Task: The list of Timesheet tasks assigned to you. Notes: Free text field for any notes. Place: An optional location of where the task is performed. If the location feature is enabled, this field will be populated automatically with the current location when you tap the refresh icon. Note: you need to allow the app to use your mobile location service. 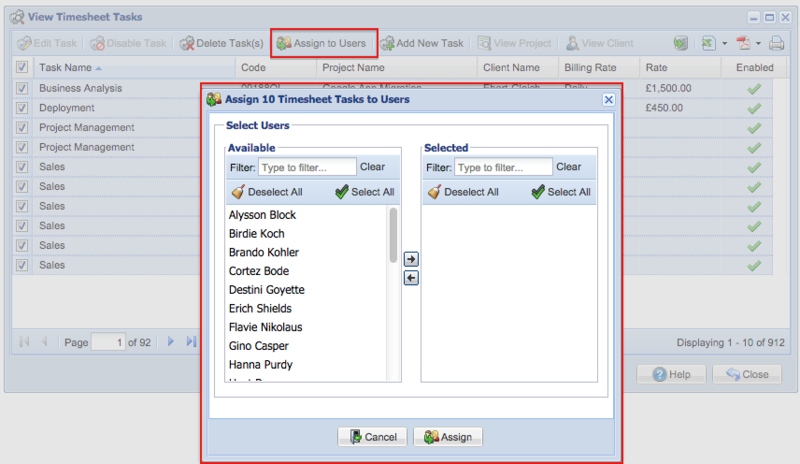 Start/Pause Timer: Starts or pauses the timer, this button will only be enabled if a timesheet task is selected. 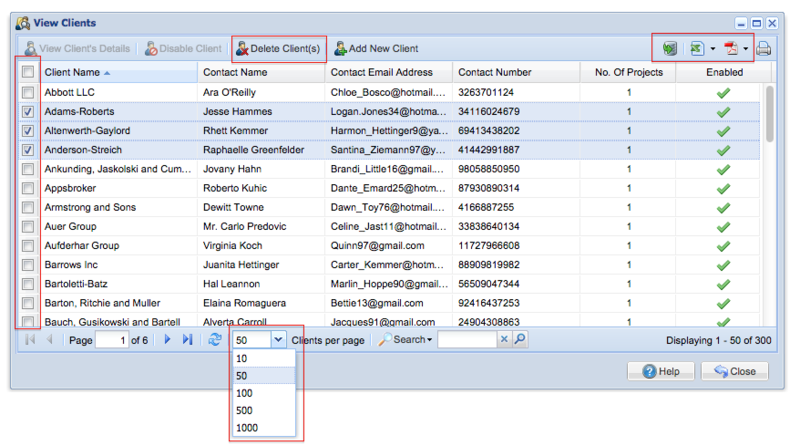 Stop Timer: Stops the timer and saves the timersheet entry to your OfficeMA Timesheet account. Reset Timer: Discard any unsaved timer progress. The Settings tab enables you to configure the various settings of the Mobile application. 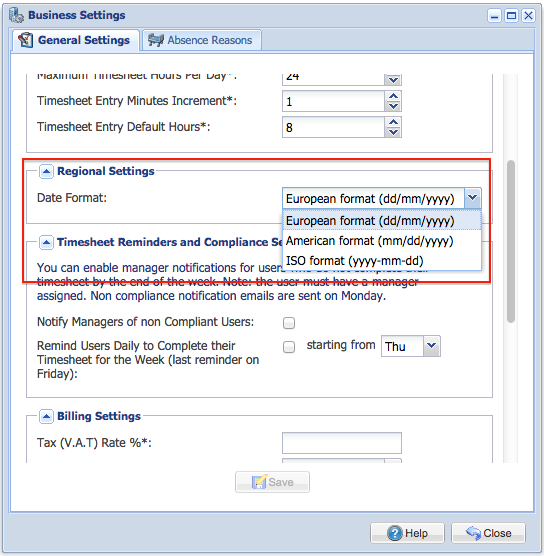 Auto Detect: Enable or disable the location feature for the timesheet timer. To logout of the application click the logout button, this will clear your stored login details and display the login screen. This tab shows the details of the current user.